Wednesday, February 19 1908 -- Heavyweight champ Tommy Burns is criticized for being money-hungry, gathering cash by fighting boxers of questionable credentials over in England. He seems to be avoiding a decision about his next serious fight. Jack Johnson meanwhile waits in the wings for his promised chance against the champ. Meanwhile Henry Berry, owner of the LA Angels, is on the warpath after some anonymous wag claims that he wears a weasel-skin hat. Russell H. Patterson was born in Omaha, Nebraska on December 26, 1893, according to a passport application signed on September 30 1920, which was found at Ancestry.com. The application said he lived in Canada from 1894 to 1914. The same birth date was recorded in the Social Security Death Index. His middle initial was recorded on his World War I draft card and passport application. …would not pay for art courses, but would support his son in the study of architecture. The result was one year at McGill University; Patterson had to leave and go out on his own when a hotel owned by his father burned to the ground. He got a job promptly, taking ads over the counter for the Montreal Star. A staff artist tipped him off to an opening in the sports department with a new weekly, The Standard. Patterson got the job, and was fired almost immediately for turning in too much material and managing to get it printed under the noses of the editors. Patterson took his work to one of the city's French newspapers, La Patrie. They liked it and offered him seventeen dollars a week. 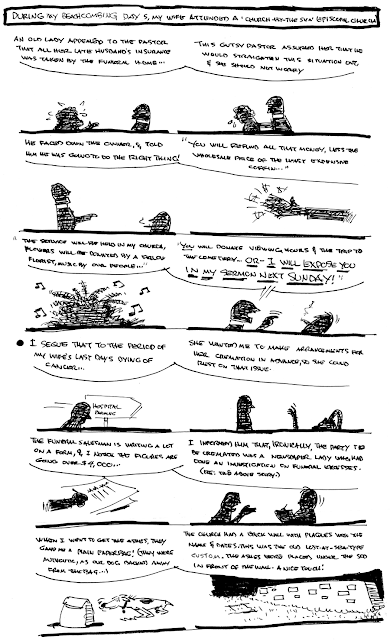 As a staffer he did a strip in French called Pierre et Pierrette…. In 1914 he moved to Chicago. Who Was Who said Patterson was a student at the Fine Arts Academy, and Art Institute. He signed his World War I draft card on June 5, 1917. He was a self-employed artist at "1517 North American Building", and named his mother and an aunt as his nearest relatives. According to the card, he served in the Canadian military for three years with the rank of corporal in the artillery. His description was medium height and build with blue eyes and brown hair. Who Was Who said he "served in Royal Canadian Air Force." 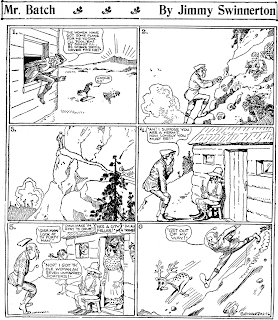 Comic Art in America said, "After an abortive attempt to join the Canadian Army in 1914—his father and brother went overseas with the first Canadian troops—Patterson went to Chicago, arriving with eight dollars…." 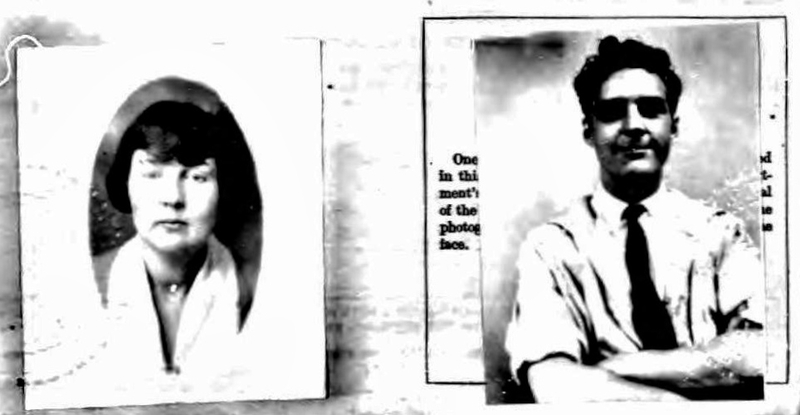 Constance and Russell Patterson passport photos. 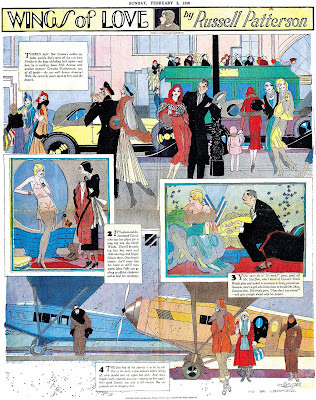 He "started" the flapper, he once told an interviewer, in Chicago around 1926, for no reason other then [sic] that he had read F. Scott Fitzgerald and that as an illustrator, he wanted to create a different look from the bovine types who were models of beauty at the time. The result was the Patterson Girl, the long-legged sophisticate with patent leather hair. He took her to New York, where she became the "look" of the 1920's as surely as the Gibson Girl had been the "Look" of the 1890's…. Advertising Arts & Crafts (1926) had this address and telephone listing, "Patterson, Russell, 22 West 49th, Bry 5976". His Runaway Ruth was published in 1929. The 1930 census recorded Patterson, his wife and daughter Elinor in Manhattan, New York City at 2 West 67 Street. His occupation was artist. The Brooklyn Daily Eagle reported his financial troubles on June 2, 1935. Russell Patterson of 307 E. 44th St., Manhattan, illustrator, filed a voluntary bankruptcy petition in Manhattan Federal Court yesterday, giving his liabilities as $23,761 and his assets nothing. Seventeen of the 129 creditors listed were doctors. The largest individual debt was a judgment for $3,532 held by Gates & Morand, Inc., 220 W. 42d St., Manhattan, on a note issued to Ballyhoo Productions, Inc. Patterson was one of five endorsers of the note. Ballyhoo was a humor magazine -- apparently Patterson had a stake in it. In the early 1930s Patterson offered advice to a young E. Simms Campbell. Patterson designed sets and costumes for Fox and Paramount Pictures, including "The Gang's All Here," 1931, "Hold Your Horses," 1933, and "Fools Rush In," 1934. He designed Shirley Temple's wardroom in her first picture, "Baby Takes a Bow". He also did sets and costumes for Florenz Ziegfeld's "Follies" and George White's 'Scandals". His work with marionettes was featured in Popular Science (October 1937), and Popular Mechanics (April 1938). Interest in Patterson's marionettes was reported in the Sydney Morning Herald (Australia) on November 2, 1937. The date of his divorce from Constance is not known. Who Was Who said his second marriage was to Ruth Cleary, a pianist, on August 13, 1938; later, they had a daughter, Russelle. 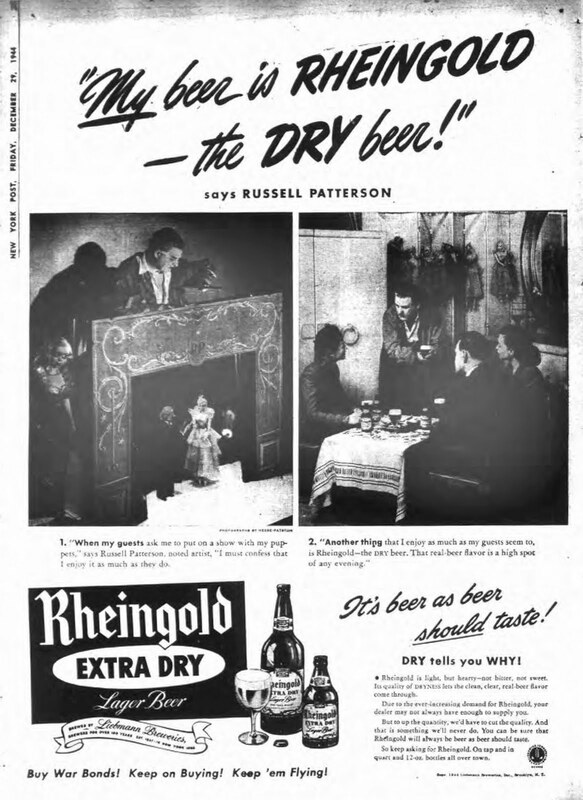 He was one of ten cartoonists and illustrators featured in a Schlitz beer ad published in Life on March 27, 1939. In 1940 I.J. Fox asked him to design that season's coats; later Macy's called, and he did Christmas-toy windows for five years. Again, he had all the advertising work he could handle. Even the war was no deterrent to him: he designed the WAC [Women's Army Corps] uniforms. He did the interior work on fifteen trains for the Western Pacific; he designed hotel lobbies, decorated restaurants, and in his spare time did a few Sunday pages for metropolitan newspapers, a chore he dropped in 1956. Patterson's New Adventures of Flossy Frills was published in the first quarter of 1941. In the same year he illustrated some of his wife's musical work, such as Rolito and Little Patriots, A Book of American Songs for Children. The panel Pin-Up Girls began in 1943. He signed his World War II draft card on April 25, 1942. His address was 70 Park Avenue, New York City. He and his marionettes appeared in a Rheingold beer ad printed in the New York Post on December 29, 1944. 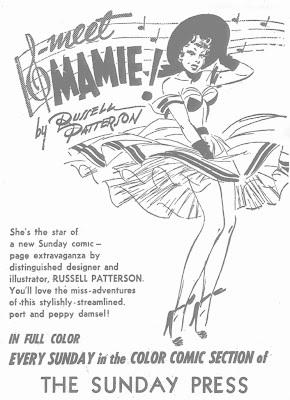 His Sunday strip Mamie was published from 1950 to 1955. Patterson passed away on March 17, 1977, in Atlantic City, New Jersey. His death was reported in the New York Times on March 19. Patterson was profiled in Stephen D. Becker's Comic Art in America (1959). Joakim Gunnarsson has a blog The Art of Russell Patterson. 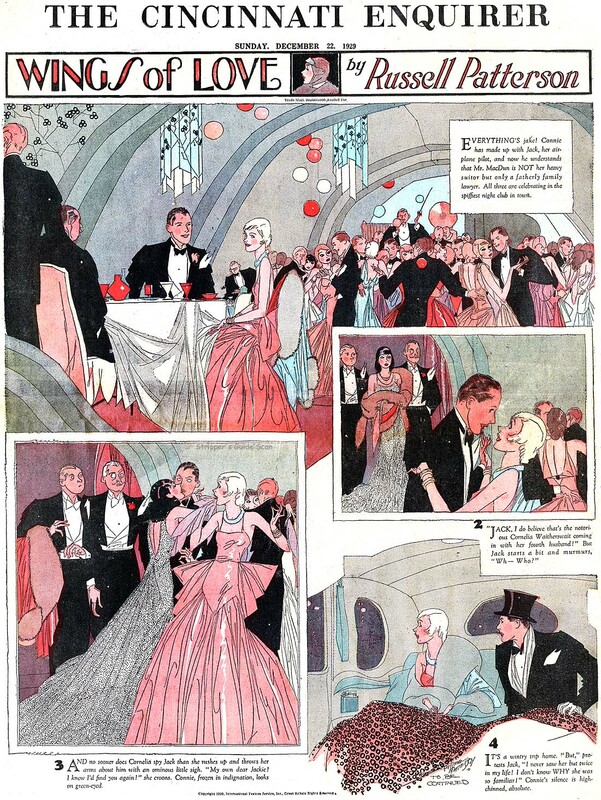 Fantagraphics Books published Top Hats and Flappers: The Art of Russell Patterson in 2006. Scans of some of his original art is at Heritage Auctions. 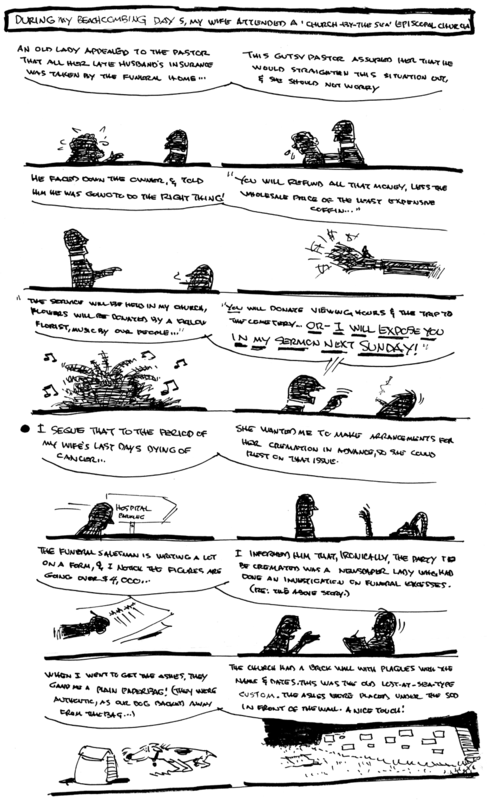 Hi, I've been working on Patterson on and off for a couple years - kudos to you for unearthing some stuff I never saw before! The snipe mentions Macy's window work in 1939. My name is Theresa and I have in my possession a framed napkin, original artwork done in watercolor by Russell Patterson to Actress/Singer/entertainer Lillian Roth stating" Thanks for the Notice at the Banshee Lunch...Russell Patterson"
Here's another of those strikingly well-drawn Sunday magazine cover series that proliferated in the 1920s and 30s; this one Wings of Love by consummate flapper artist Russell Patterson. As is typically the case with these series, it's a slightly dopey love story, this time involving an airplane pilot. I probably don't need to tell you that although the two seem doomed to be apart in these samples that in the end love does triumph. Wings of Love ran from November 3 1929 to February 9 1930, and was syndicated by Hearst's International Feature Syndicate arm. Thanks to Cole Johnson for the second sample above. These pages are drop-dead gorgeous! Those artists fortunate enough to have worked during the full-page feature days sure made the most of their enormous canvas. 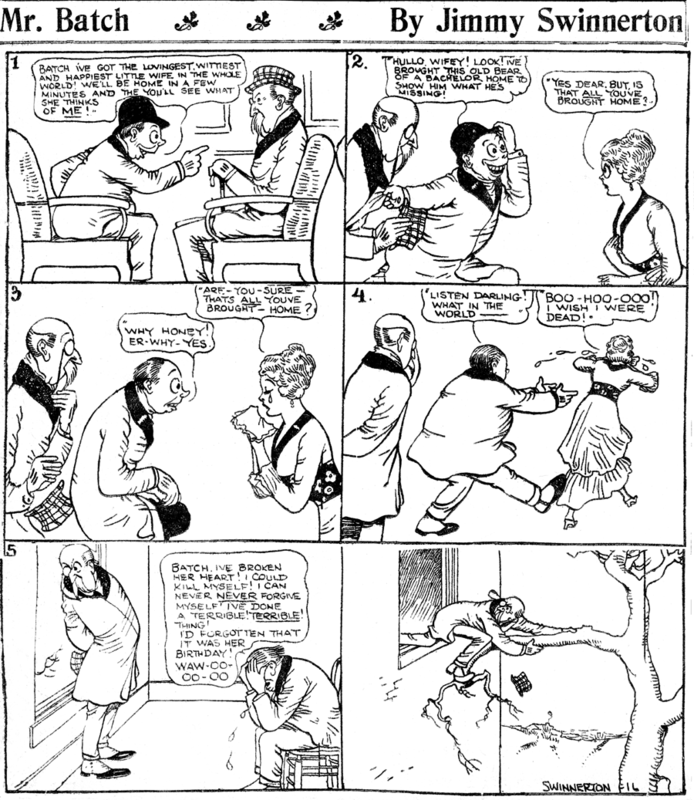 Jimmy Swinnerton used Mister Batch as a recurring character in several strips. His schtick was that he had survived into old age without ever being caught in the bonds of matrimony, and his experiences only served to confirm the wisdom of his philosophy. 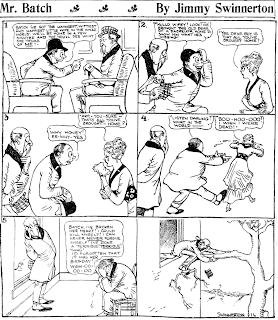 First appearing regularly in Bad Mans (1908-11), then in his own Sunday strip (1912-13), we're focusing today on his third and final go-round, a weekday strip that ran sporadically from January 17 to July 25 1916. 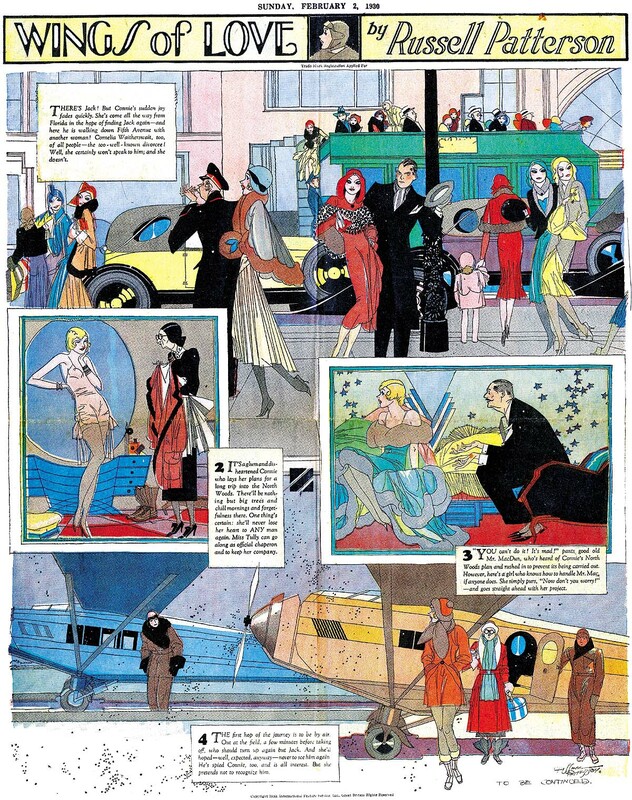 In the New York American the strip ran pretty regularly through the beginning of March, but then only five more times through the end date. I suspect that the strip was produced much more often than that, but only ran in syndication. The Hearst bullpen was really cranking out product at this time and the American and Journal just didn't have enough room for it anymore. This was basically the beginning of a trend that would snowball in coming years, for syndicate flagship papers to run only a limited selection of the syndicate's output. Ha ha! I wonder if Batch ever uses a door? Alvin Irving "Irv" Tirman was born in Brooklyn, New York on September 7, 1910. His name and date of birth are from the U.S. Veterans Gravesites at Ancestry.com; his place of birth was based on his parents residence in the 1910 U.S. Federal Census, which was recorded in April. He was David and Charlotte's first child. Tirman's father signed his World War I draft card on September 12, 1918. His address was in Brooklyn at 1901 Bergen Street. In the 1920 census, Tirman was the oldest of three sons. The family lived in Scranton, Pennsylvania at 1306 Capouse Avenue. In 1930, the family of five lived in Brooklyn at Flatbush Court, 2069 Nostrand Avenue. Information on his art training has not been found. Tirman's comic strip, Nappy, was distributed, in 1939, by Lincoln Newspaper Features. It began in the Cayuga Chief (Weedsport, New York) on October 13, 1939 (see below). Below, a selection of strips published in Fords Beacon (New Jersey): #354, April 3, 1942; #388 and 389, June 12, 1942. 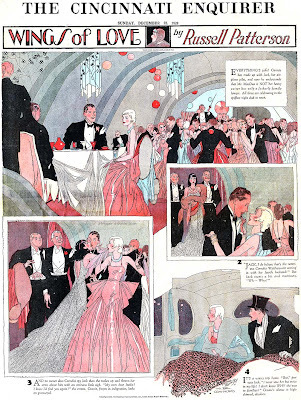 Lambiek said he worked as a comic book artist during the 1940s. The Grand Comics Database has a list of his comic book credits. The U.S. World War II Army Enlistment Records, at Ancestry.com, recorded his enlistment on March 24, 1944. He had four years of high school and was a widower with dependents. Sheeshkebab sandwiches and shashlik sandwiches. Serial No. 594816, Feb. 27. Class 46. According to Lambiek and other sources, his strip, Melvin, was published in 1953. (However, in E&P, March 7, 1953, the strip was to be syndicated by Editors Syndicate, a very small outfit. The strip was offered, but was not cited as running yet, which typically means they were still fishing for clients. Since Editors Syndicate did submit listings to the Syndicate Directory, and Melvin did not make it into the 1953 book, that means it was presumably a dead issue. --Allan) Tirman passed away on August 2, 1965, according to U.S. Veterans Gravesites. 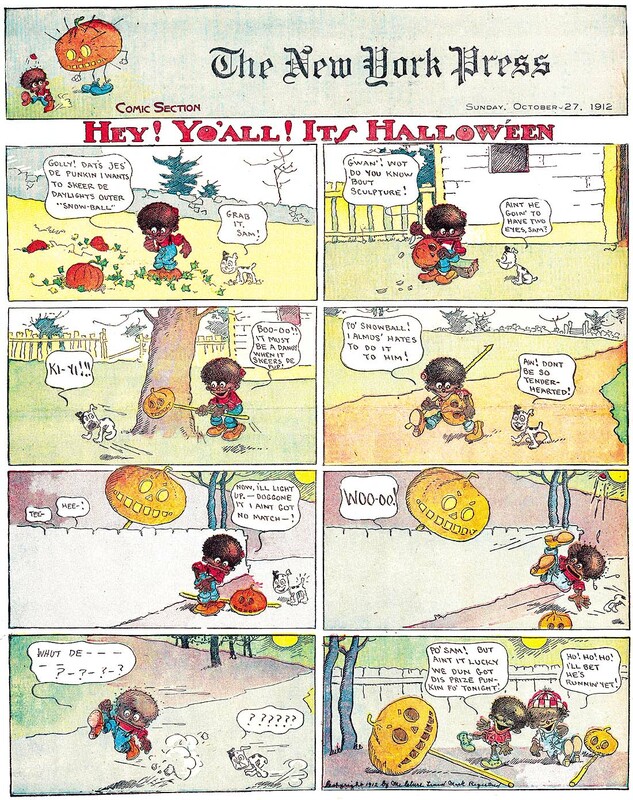 He was buried at the Long Island National Cemetery in Farmingdale, N.Y.
... and happy halloween from Sambo and his Funny Noises, October 27 1912, courtesy of Cole Johnson.